The best part of belonging to Chemo Savvy is the fun and camaraderie of paddling in a dragon boat. Following three months of weekly indoor fitness training, the team moves to the water to paddle three times a week during the summer months along the Red River. The time on the river is spent preparing for races but is first and foremost fun. Members improve their physical fitness, as well as offer and receive support through the challenges of breast cancer. 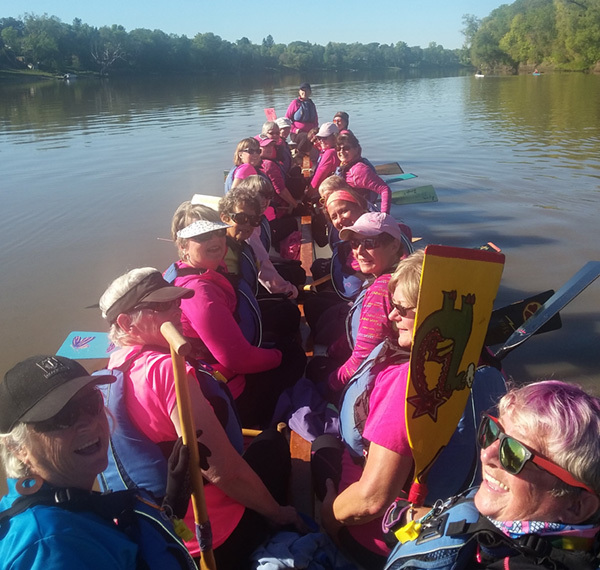 Every breast cancer survivor, no matter their age, fitness level or paddling skill is welcome to become a member of our team. Most of us never picked up a paddle until we joined Chemo Savvy! Chemo Savvy participates in races both locally and further afield. The team has traveled to numerous cities across Canada, into the Northern US & Florida, as well as internationally with trips to New Zealand, Australia, Israel and Italy. Over the years we have been fortunate to win trophies and medals at many paddling events. But no matter what, we are always “First in our Lane”. Throughout the year the team participates in events to promote the importance of fitness, exercise and healthy living as part of the equation in the fight against breast cancer. Activities range from fundraising walks/runs, interviews with the media, school appearance, public information displays, golf tournaments, fashion shows, parades and the list goes on. These public appearances are important to fulfilling our team’s mission and vision. One of the most special parts of our teams’ dragon boat experience is the flower ceremony. In 1996, the first roses were thrown to the water by a Canadian breast cancer dragon boat team in honour of a teammate facing recurrence and an uncertain future. 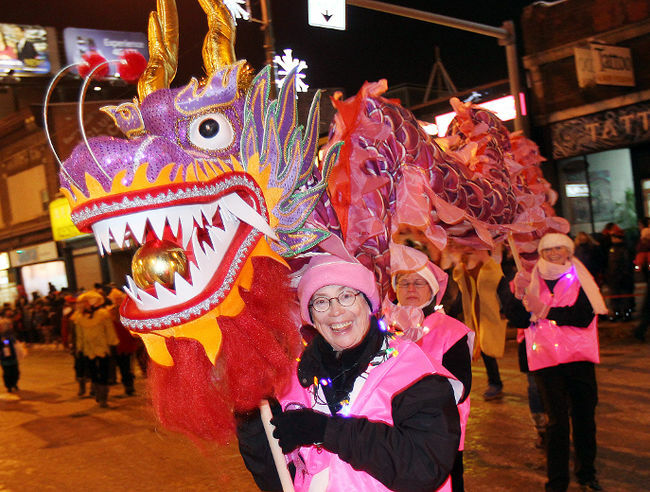 The ripple from those flowers was felt around the world, and today this International ceremony is repeated by breast cancer survivor teams at festivals on five continents. For Chemo Savvy, this is the most important part of the competition. We take this moment to restate our challenge against this deadly disease. 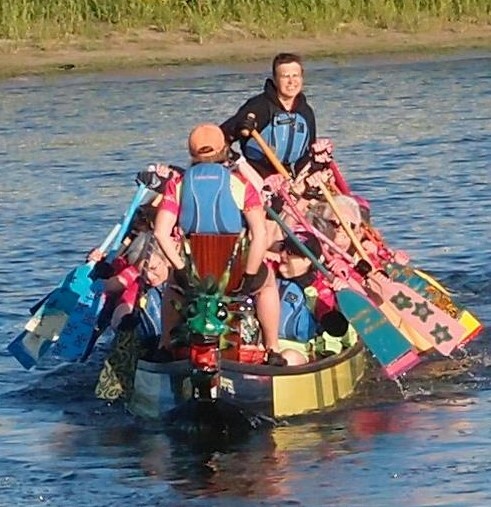 Each team member carries a pink rose with them into the boat. This rose is a symbol of HOPE for those embroiled in their own battle with cancer, and pays tribute to those who have lost the fight. 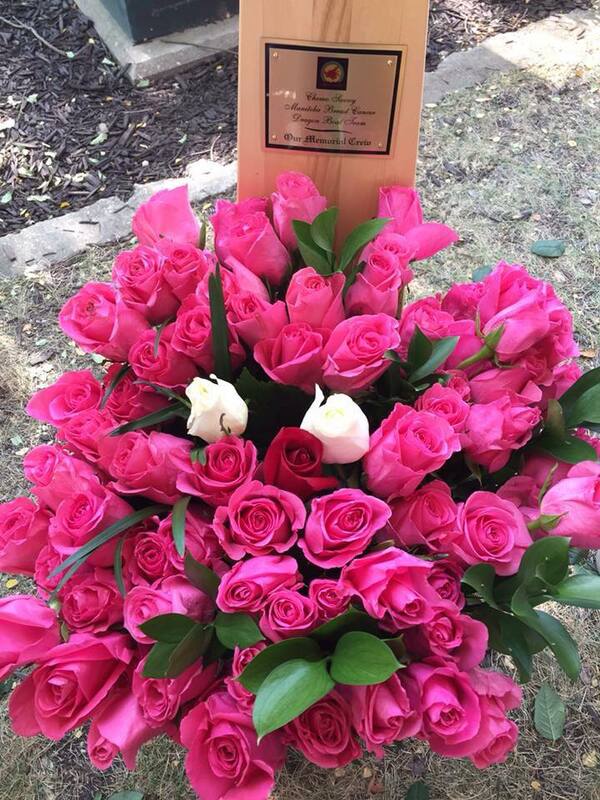 Among the pink roses are individual white ones - these are a special tribute to team members who lost their life to breast cancer in the past year. We toss our flowers to the awaiting water, with a moment of silence as we remember and reaffirm our promise to stay in the race until it is won. The honour boat is a list of all once members of Chemo Savvy who have lost their battles with breast cancer or have otherwise passed. It is one of the most important aspects of our team, that we will never forget their contributions to our team in the fight against breast cancer; we will stay in the race until it is won! The honour boat members have their names engraved on a special memorial paddle that the team brings to special events and displays. Memorial bricks are located in historic King's Park, the Carol Sheilds Labyrinth is in an environment designed for meditation, healing and reflection. The gardens feature donor and memorial bricks. 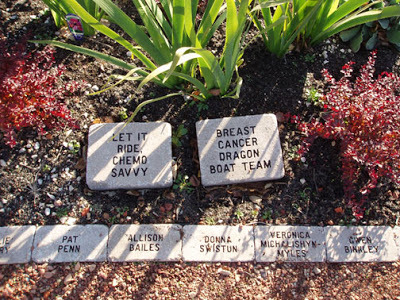 Chemo Savvy has a cluster of bricks within the garden engraved with members’ names from our honour boat. Upon passing of a member, a brick is place in the garden, at a small team ceremony. Former team member may have bricks purchased by family or friends. Adjacent to the labyrinth there is a bench dedicated to our fallen members – “Memories of their strength and courage keep us true to our promise to stay in the race until it’s won”. Each year, Chemo Savvy holds a paddle painting workshop. The Laurie Potovsky-Beachell Memorial Paddle Painting Workshop was named in honour of an original member of Chemo Savvy and skilled artist who ran the workshop for many years. New members of Chemo Savvy are encouraged to hand paint a paddle that reflects their own feelings and experiences. The results are beautiful meaningful paddles; each telling the story of a personal journey, hopes for the future and memories of the past. Creating this beautiful paddle art is part of the teams' healing journey. The team is recognized as often for our paddles as for our paddling itself. Chemo Savvy undertakes one major fundraising event per year with the sale of our signature Dragon Wing Begonias. Sale of these beautiful plants allows us to keep our fees affordable for members and allows us to be able to waive fees for those who otherwise could not participate. The plants are available in time for Mother’s Day and throughout the month of May. Contact the team if you are interested in purchasing one of these beautiful baskets. In the garden at the Breast and Gynaecological Cancer Centre of Hope you’ll see a window box marked Chemo Savvy. 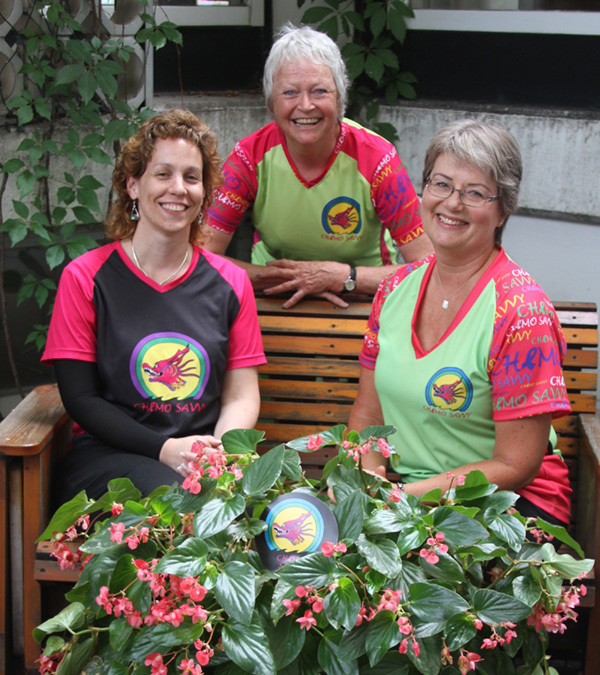 Every year our team participates in the garden with the contribution of our Dragon Wing Begonia; a true reflection and metaphor for resilience, strength and beauty, despite a diagnosis of breast cancer.